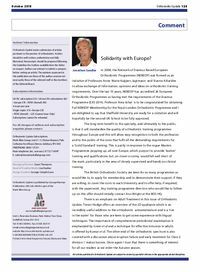 Orthodontic Update: Issue - Article: Solidarity with Europe? Editorial Comment: Solidarity with Europe? Abstract: In 2008, the Network of Erasmus Based European Orthodontic Programmes (NEBEOP) was formed as an initiative of Professors Anne Marie Kuijpers Jagtmann and Stavros Kiliarides to allow exchange of information, opinions and ideas on orthodontic training requirements.